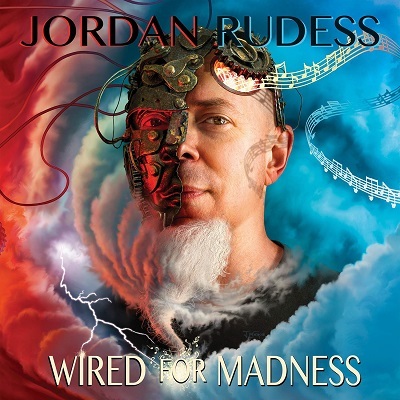 Jordan Rudess is the keyboard player in Dream Theater, a role he’s held for twenty years. He’s also a successful business man having formed a software company in 2010 to create new music tools to run on tablets and computers. Alongside this he’s also a busy solo artist with “Wired for madness” being his 15th solo album. He’s even followed the example of legendary rock keyboard player Jon Lord by creating some classical music (2010’s Explorations for Keyboard and Orchestra). On this album he’s got a few special guests – drummer Marco Minnemann, guitarists Vinnie Moore, Guthrie Govan, Joe Bonamassa and John Petrucci, plus Dream theater frontman James LaBrie. As you’d expect from a man who has composed classical music as well as playing in a band like Dream Theater, there’s a serious amount of talent on display here. The music is so diverse – at times it’s prog, at others it’s blues or jazz, while at others it’s simply impossible to categorise other than “damn that’s good”. It’s largely instrmental in places – opening track “Wired for madness – part one” for example only has vocals in the last two minutes of this eleven minute epic. Most of the tracks do in fact have some vocals but there are lots of instrumental sections. Overall I think the balance is about right – there’s plenty of space for the instruments to take centre stage but the vocals help keep it interesting. The music is absolutely superb – not just the keyboard playing, but everything, which is understandable with the calibre of musicians involved, and the vocals are just beautiful, but the top credit has to be for the writing which has done a seemingly impossible job of including so many different sounds and styles together and making them all feel like they belong together. It’s a fantastic album – well worth a listen.